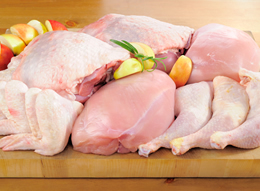 Piper Ranch is pleased to offer pasture raised Chicken and Quail meat. It doesn't get any better than poultry raised on pasture. Our birds are lean, firm, and flavorful due to their healthy living environment. Our birds have, fresh air, water and pasture that is part of their daily routine. Pasturing allows them to live the way nautre intended. We also have chicken and quail eggs for sale. Did you know that quail eggs are very nutritious? One quail egg contains 13 percent protein vs. 11 percent in chicken eggs. That is three times as much vitamin B1, twice as much vitamin A and B2, five times as much iron and potassium, and are richer in phosphorus and calcium than a chicken egg. Our poultry is pasture raised.